CULLMAN – Democratic candidate for U.S. House of Representatives, Lee Auman, hosted a town hall meeting Thursday night at the Cullman Civic Center. 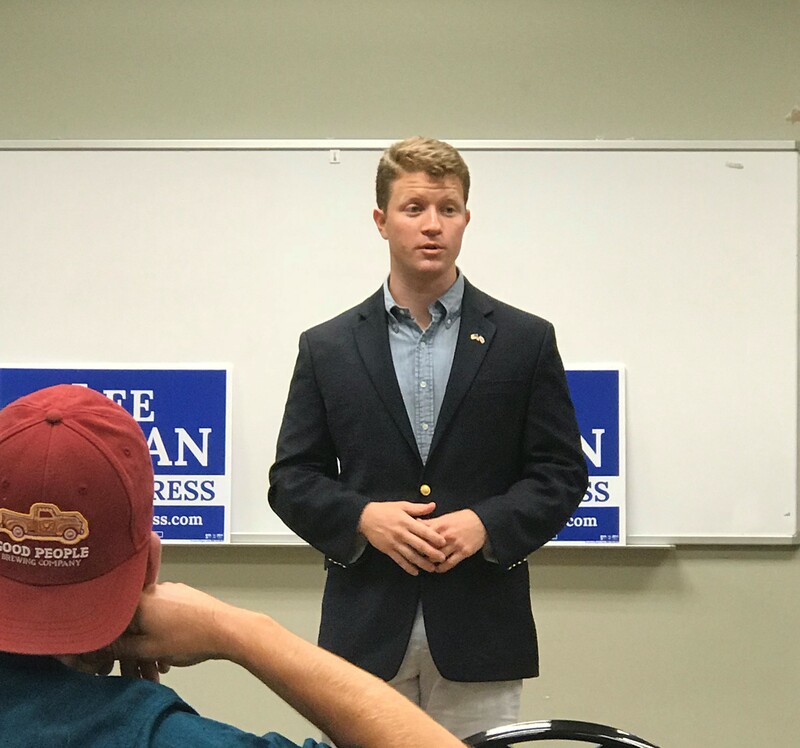 It was one of at least a dozen town halls Auman has planned across Alabama’s 4th Congressional District, which includes Colbert, Cullman, DeKalb, Etowah, Fayette, Franklin, Lamar, Lawrence, Marion, Marshall, Walker and Winston counties as well as parts of Blount, Cherokee, Jackson and Tuscaloosa counties. Auman is seeking to unseat 22-year Republican incumbent U.S. Rep. Robert Aderholt, who has run unopposed in the past three elections. A native of Union Grove in Marshall County, Auman attended Snead State Community College and graduated from Auburn University. He joked with those in attendance about being an “AU-man.” While attending Auburn, he served as a youth minister and worked with individuals with special needs. Before opening the meeting up for questions, he spoke about three areas of major concern: the opioid epidemic, the closing of rural hospitals and the slow economic recovery in many areas due to failing infrastructure. Auman hopes to introduce a bill requiring a national prescription database to help physicians better identify patients who have multiple prescriptions and those seeking out multiple doctors. Auman also has ideas to reduce the high level of rural hospital closings. He supports ending the reductions in disproportionate hospital funds. He said that should have been done when the United States Supreme Court ruled a federal mandate to expand Medicaid unconstitutional and a state-level decision. A local farmer asked Auman his views of recent tariffs imposed by President Donald Trump and bailouts paid to farmers hurt by them. “My positions on gun safety are based on evidence, not ideology,” Auman said. His website, www.aumanforcongress.com, details his recommendations for reducing gun violence including closing loopholes for background checks and closing the “boyfriend loophole” by prohibiting convicted stalkers and abusers from owning guns. The general election is on Tuesday, Nov. 6. Next articleForum: What’s needed to attract workers to Cullman County?